Bharti Enterprises plans to invest $2.5 billion by 2015 building hypermarkets and supermarkets and projected a revenue of $4.5 billion in the next eight years. However, indications are that the brand name of Wal-Mart, the world's biggest retailer, may take a miss at the front-end retail stores in the country to be set up from the first quarter of next year. Ahead of discussions with Vodafone, Indian conglomerate Essar said today it wanted 'partnership of equals' and 'joint management' in the country's fourth-largest mobile venture Hutch-Essar, where the UK giant is taking majority stake. Debunking reports that it could exit the business, provided Vodafone paid a premium for its 33 per cent stake in Hutch-Essar Ltd (HEL), Essar Teleholdings CEO Vikash Saraf said: "We are the founder partner and shareholder. We will continue as a strategic partner in HEL and not as an investment partner. Reliance Industries Ltd has found new natural gas reserves in Krishna Godavari basin D6 block off the east coast, the company's minority partner Niko Resources has said. The State Bank of India (SBI) today revised its benchmark prime lending rate (BPLR) by 75 bps from 11.5 per cent per annum to 12.25 per cent with effect from tomorrow. Pakistan, in conflict with India over allowing imports of more products under the South Asian Free Trade Area (SAFTA), said today it was hopeful of reaching a "breakthrough" in bilateral trade relations. Shoemaker Bata India Ltd has sealed some of its retail outlets in the metropolis apprehending trouble after it suspended or terminated services of shop managers and employees. Low-cost carrier Spicejet said today it had allotted 1.30 crore equity shares to the BNP Paribas Arbitrage Fund out of the proposed preferential issue of 7.20 crore equity shares for over Rs 68 crore. Hyundai Motors India Ltd has announced a special scheme targeted at women buyers across India offering attractive loan packages. As a part of the Special Women Scheme, HMIL is offering women customers specialised loan packages such as free third year warranty and other schemes on purchase of new Hyundai cars. IT company Hexaware Technologies has earmarked about $40 million to acquire firms in the services segment in Europe. Reliance Life Insurance today announced the launch of Reliance Money Guarantee Plan, a plan that guarantees all premiums paid by the consumer and also aims to protect the returns made on investments. A high-level government panel has admitted seven more public sector firms, including Hindustan Aeronautics Ltd (HAL) and National Aluminium Company (Nalco), into the coveted Navratna club, taking its membership to 16. Siemens AG, Europe's biggest engineering company, agreed to purchase a majority stake in Czech Republic's OEZ to expand in eastern Europe. A major fire broke out today at Cadila Pharmaceuticals' API (active pharmaceutical ingredient) unit located at Ankleshwar town of south Gujarat, prompting the authorities to shut down the plant. Bharti Enterprises plans to invest $2.5 billion by 2015 building hypermarkets and supermarkets and projected a revenue of $4.5 billion in the next eight years. However, indications are that the brand name of Wal-Mart, the world's biggest retailer, may take a miss at the front-end retail stores in the country to be set up from the first quarter of next year. Shares of Bharti Airtel today surged 2.4 per cent to a new intra-day high riding on the group's plans to invest up to $2.5 billion by 2015 in its retail venture with Wal-Mart. Bharti will also meet executives of Wal-Mart Stores Inc. this week to finalise the joint venture. "We are in discussions ... they are coming this week, and the team will be led by Mike Duke (Wal-Mart Vice-Chairman and head of international operations)," Mr Rajan Bharti Mittal, Joint Managing Director of Bharti Enterprises, told a news conference. He said Bharti Retail would build hypermarkets, supermarkets and other stores to sell mainly locally sourced groceries, electronics, clothing and furniture, Mr Mittal said. He, however, clarified that this investment was only for setting up front-end stores while a separate plan and investments for real estate would be announced shortly. “We are still studying the model to be adopted - to buy the property or to get the land on lease. Our group company, Bharti Real Estate, is looking at all options,” Mr Mittal said. Mr Mittal said the company was working out modalities for its back-end linkage, including its joint venture with the world's largest retailer Wal-Mart. As per the plans, the company was looking at 10 million square feet of retail space, which would include hypermarkets, supermarkets and convenience stores, he said, adding that the company would provide employment to about 60,000 persons. While Bharti would manage front-end of the retail venture, Wal-Mart would be involved in the back-end, including logistics, supply chain and cash-and-carry. According to studies, India's retail sector is estimated at $300 billion and could more than double by 2015. India allows single-brand foreign retailers to take up to 51 per cent in a joint venture with a local firm, but bans multiple-brand retailers from investing in front-end retail. Organised retail makes up only about 3 per cent of India's retail industry, but is forecast to rise to 15-18 per cent by 2011-12, attracting global interest from large retailers such as Britain's Tesco Plc. and France's Carrefour. Shoprite Holdings, Marks & Spencer Plc. and Germany's Metro AG have wholesale cash-and-carry and franchise operations in India. Bharti and Wal-Mart will also have to contend with retail operations of local rivals including Reliance Industries Ltd., ITC Ltd., Pantaloon Retail Ltd., the Tata group and the Aditya Birla group. "We are totally in line ... in sync with the government thought," Mittal said. "We want to co-exist with smaller convenience stores. We are even looking at franchising these stores," he said, referring to the thousands of non-organised retailers that control much of the retail sector. Ahead of discussions with Vodafone, Indian conglomerate Essar said today it wanted 'partnership of equals' and 'joint management' in the country's fourth-largest mobile venture Hutch-Essar, where the UK giant is taking majority stake. Debunking reports that it could exit the business, provided Vodafone paid a premium for its 33 per cent stake in Hutch-Essar Ltd (HEL), Essar Teleholdings CEO Vikash Saraf said: "We are the founder partner and shareholder. We will continue as a strategic partner in HEL and not as an investment partner. "So, where is the question of seeking a premium?" he wondered and said: "The fundamental tenet of the partnership with Vodafone will be a partnership of equals where both sides have a meaningful role. This will be the basis for any agreement with Vodafone." Discussions between Essar promoters Ruias and Vodafone are expected to start later this week for which group's Vice- Chairman Ravi Ruia is slated to fly to London. After clinching the deal to acquire 67 per cent stake in HEL for $11.1 billion, Vodafone CEO Arun Sarin had visited India last week and held discussions with the Ruias. Winding up his 3-day visit, India-born Sarin had exuded confidence that an agreement with Essar would be signed soon. Asked about Vodafone's response to the Ruias, Saraf said: "We have communicated our views. Discussions are at a preliminary stage. They (Vodafone) have also expressed almost similar views, saying that Essar can add lot of value. The Hutch-Essar partnership that started with just $800 million and swelled to nearly $19 billion in a matter of six years could not have been possible had either of the partner been difficult, Essar said today. "This has been demonstrated in the sharp appreciation in the value of the venture that started with just $800 million in 2000." HTIL last week agreed to sell its controlling stake in the firm at an enterprise value of $18.8 billion. "The deepwater frontier drilling rig has now completed the drilling of an exploratory well, AA-1, which has resulted in (discovery of) a new high-potential natural gas zone," Niko Resources, which holds a 10 per cent stake in the block, said Niko Resources. Reliance has, till date, made over 12 gas discoveries and two oil finds in KG-DWN-98/3 block, also known as D6. The AA-1 well is located in the new 3D seismic area, south-east of the previous gas finds. "The drilling rig (has) commenced drilling of the Q1 exploratory well. The Q1 well is approximately 15-km southwest of AA-1 and 8-km northwest of the P1 natural gas discovery," it said. All of D6 is now covered with 3D seismic. Processing and integration of the surveys are expected to be completed by year-end. Reliance had found oil reserves in MA-1 and MA-2 wells in D6 block with total reserves being put at 140-million barrels. It will invest $1.43 billion to produce 40,000-50,000 barrels per day of oil from the finds by the first quarter of 2008. Gas production from the block will begin in mid-2008 and the company is investing $5.2 billion in bringing to production Dhirubhai-1 and 3 discoveries, first two of the over 12 gas finds. US energy major Chevron Corp may increase its stake in Reliance Petroleum Ltd to 29 per cent and explore equity partnership in Reliance Industries' gigantic Krishna Godavari basin gas field when its Chairman and Chief Executive David J. O'Reilly comes calling this week. Mr O'Reilly, who arrives here tomorrow on a four-day visit to India, is scheduled to meet Reliance Industries' Chairman and Managing Director Mukesh Ambani at Jamnagar on February 23. The bank has also revised the interest rates on the super saver term deposit scheme, a statement said. Considering the importance of providing cost-effective credit to the important sectors of the economy, some specific sectors have been excluded from the impact of the above change in the PLR which include all existing housing loans under the priority sector, educational loans, existing and future agricultural production loans less than Rs 3 lakh and new educational loans up to Rs 4 lakh. Bangalore: Vijaya Bank would shortly raise its prime lending rate by 50 basis points to 12.25 per cent. The bank had raised its PLR thrice in the current financial year -- 25 basis points on each occasion to the present 11.75 per cent. "It could go up by 0.5 per cent to 12.25 per cent", the Bank's Chairman and Managing Director Prakash P Mallya said, but added that the rate hike would not apply to the existing housing loan borrowers. Mr Mallya also said the bank intended to raise Rs 200 crore by way of tier-II capital in the current financial year. The bank was on course to post a business of Rs 60,000 crore in 2006-07, up from Rs 44,000 crore in the previous fiscal. Its full-year net profit was expected to be about Rs 350 crore, he added. Mr Mallya said the bank currently had a branch strength of 948, a number expected to go up to 1,000 by March-end. "We are hopeful of a breakthrough... we are hoping for better trade relations with India," Pakistan's Minister of State for Commerce Hamid Yar Hiraj said when asked about his country's reluctance to open markets for India under SAFTA. Hiraj is leading a 187-member business delegation, the largest-ever from Pakistan to India. His comments came just days before trade ministers of SAARC countries meet in Kathmandu to sort out issues coming in the way of full implementation of SAFTA. Hiraj, who met Commerce Minister Kamal Nath today, said the issue of Pakistan limiting the number of products it would allow to be imported from India and other problems in full implementation of SAFTA would be discussed in Kathmandu. Officials of SAARC member countries are meeting on February 24. The Committee of Experts, at the Joint Secretary-level, will discuss issues such as sensitive list, non-tariff barriers and dispute settlement mechanism. The report of the committee would be presented to the ministers who will begin their meeting on February 26. When SAFTA came into effect in June last year, Pakistan allowed tariff reduction on import of 4,872 products from Sri Lanka, Bangladesh, Bhutan, Nepal and Maldives. However, in case of India, it limited these concessions on the products in the "positive list" of 773 items. In November last year, it expanded this list to 1,075 items. India, which has opened up its markets for Pakistan as required by agreement on SAFTA, has objected to Islamabad's stand at bilateral and SAARC meetings. It has said SAFTA would be meaningless if Pakistan continued to trade with positive list instead of a negative list. A Bata spokesman said the shop managers and employees refused to comply with the new working hours approved by the West Bengal Government under the Shops and Estabishment Act. The state government had given permission to keep shops open throughout the week, while managers and employees would be given weekly off on rotational basis. He said that similar approvals were also given by the Delhi and Karnataka Governments. The spokesman said the management had taken control of shops at the Oberoi Grand arcade, Hindustan Park, Lindsay Street, College Street and Sealdah. According to him, the auditors visited the stores today for inspection and they would be re-opened from tomorrow. The BNP Paribas Arbitrage Fund acquired about 1.30 crore shares, representing a 5.43 per cent stake in the airline company through the preferential allotment, Spicejet said. Hyundai Motors India Ltd has announced a special scheme targeted at women buyers across India offering attractive loan packages. As a part of the Special Women Scheme, HMIL is offering women customers specialised loan packages such as free third year warranty and other schemes on purchase of new Hyundai cars. "The number of women car buyers is on the rise in the country, and automobile companies are wooing women buyers with loan schemes and other distinctive offers. The 'Santro' and 'Getz' are considered women-friendly cars and we are pleased to offer this special scheme to all women drivers across the country," HMIL Vice-President, Marketing & Sales Arvind Saxena said. The scheme is valid till February 28 but is available only on purchase of 'Santro' and 'Getz' models, the company said. "We are looking at acquisitions in the services segment in Europe. 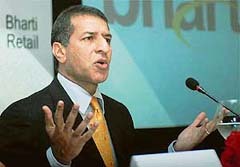 This will be mainly in ERP, business intelligence, BFSI and transportation verticals," company Chairman Atul Nishar said. Hexaware's liquidity was about $70 million and hence the acquisitions, expected to be sealed this year, would be executed through internal accruals, Mr Nishar said. Within India, the company would invest Rs 170 crore at its Chennai campus, mainly for human resource development and physical infrastructure. An additional Rs 20-30 crore has been earmarked for its other centres. Meanwhile, Hexaware has posted a profit after tax of Rs 42.81 crore for the fourth quarter ended December 31 and has declared a dividend of 40 per cent. The company's profit after tax was Rs 30.05 crore in the year-ago period. The total income stood at Rs 143.47 crore for the last quarter in the latest fiscal while the same was Rs 106.59 crore for the quarter ended December 31, 2005, Hexaware said. "Reliance Money Guarantee Plan (RMGP) is a unit-linked plan that addresses the comprehensive need to strike a perfect balance between savings and protection," a company statement said here. The new plan carries an exchange option that allows the customer to shift to a different unit-linked plan and get the benefit of discounted allocation charge. On the other hand, the settlement option enables the customer to take the maturity proceeds in the form of periodical payments after the maturity date up to a maximum of 5 years instead of a lump sum on the maturity date. "RMGP has been designed keeping in mind the consumers expectation of maximising his gains without any fear of losing the capital. This plan ensures that the returns made are safeguarded, using the return shield option, thus limiting exposure to risk in an event of a negative market, Reliance Life Insurance CEO P Nandagopal said. While nine companies were in the fray, the Apex Committee headed by Cabinet Secretary B.K. Chaturvedi cleared seven names last week, official sources said. Now, only the respective ministers have to sign the necessary documents, they said. Other companies who have been conferred the status are Bharat Electronics Ltd (BEL), National Mineral Development Corporation, Rural Electrification Corporation (REC), Power Grid Corporation of India Ltd and Power Finance Corporation. They join the league of nine companies — BHEL, NTPC, SAIL, BPCL, HPCL, GAIL, ONGC, IOC and MTNL. The Navratna status would greatly enhance the financial and administrative powers of Boards of these seven PSEs. They will be able to forge joint ventures and wholly-owned subsidiaries in India or abroad up to 15 per cent of their net worth in one project limited to Rs 1,000 crore. OEZ is the market leader in the Czech Republic and Slovakia for "low-voltage controls and electrical installation technology," Munich-based company said today. "There are no reports of any casualties in the fire that broke out at the company's unit located in Ankleshwar GIDC area (about 195 km from Ahmedabad)," Nilesh Upadhayay, resident Deputy Collector of Bharuch district said. "After almost two hours of fire-fighting, the fire has been brought under control. However, we are yet to know the cause of the fire," Upadhayay added. According to officials of the Cadila Pharmaceuticals, the Ankleshwar plant has been shut down after the fire and is expected to remain closed for about a week.